In the face of economic pressure and international criticism, the Palestinian Authority still vows to spend every last penny it has to pay those who murder Jews. Financial support to terrorists' families will continue despite the United States cutting aid to the PA over the so-called "pay to slay" issue. The Palestinian Authority says taking care of those who murder Jews is a top priority. "By Allah, even if we have only a penny left it will only be spent on the families of the martyrs and prisoners and only afterward will it be spent on the rest of the people," said PA Chairman Mahmoud Abbas. Earlier this year, the United States moved to punish the PA for the pay-to-slay policy. It put the Taylor Force Act into effect, which cuts US aid until the PA stops rewarding terrorists and their families. Australia followed suit in July. The rest of the world has yet to act. "The international community, first of all, has to recognize that the Palestinian Authority paying salaries to terrorists is really a symptom of the fundamental problem and that is that the Palestinian Authority sees killing Israelis, killing Jews as something heroic," Itamar Marcus, founder and director of the Palestinian Media Watch (PMW) told CBN News. His organization has monitored reports and speeches from the region for more than 20 years. "So the Palestinian Authority has put these killers on a pedestal," Marcus continued. "They've turned them into heroes and role models for the Palestinian people. By now, they can't even back off. They can't even backtrack. They are going to keep rewarding these killers with the money that they're getting, to a large extent, from foreign donors." 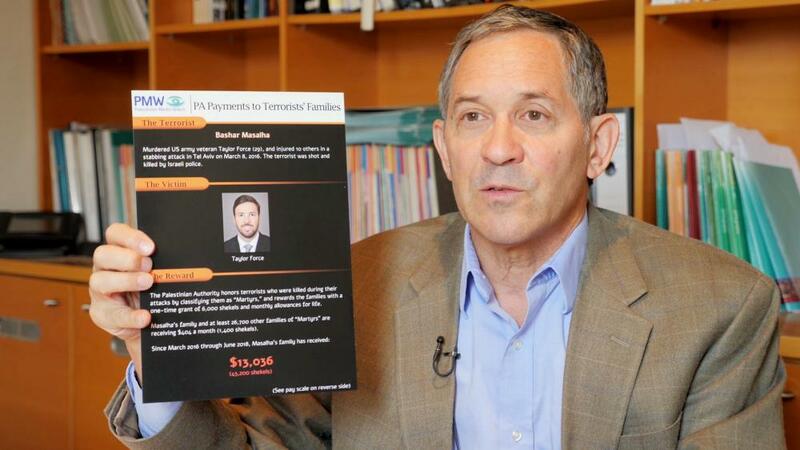 PMW prepared posters to expose the terrorist and their crimes while laying out the scope of the payments. "We've got Abdallah Barghouti…I would say the most notorious Palestinian mastermind of terror. He built the bombs for suicide bombings of Sbarro restaurant, Zion Square, Hebrew University; killed Americans, killed Europeans, killed altogether 67 people. He's serving 67 life sentences, these are among the 67 people, and he's already also received about $200,000...and he will continue receiving a salary, eventually receiving $3,500 a month. The Taylor Force Act is not only a law, but it acts as a symbol as well. "We created a special poster in memory of Taylor Force, an American veteran who was murdered in Tel Aviv. The person who killed him was a terrorist named Bashar Masalha, who himself was killed right afterward by Israeli forces. Bashar Mashalcha's family is now rewarded for life. They've received up till now $13,000. The 2018 budget for rewarding martyrs' families and wounded is nearly $200 million. Marcus says this doesn't bode well for the peace process. "Until the Palestinian Authority changes its ideology and sees murder as murder and sees murder as something punishable, there's no one really to talk to on the Palestinian side," he said.